Mia Barron in The White Album. 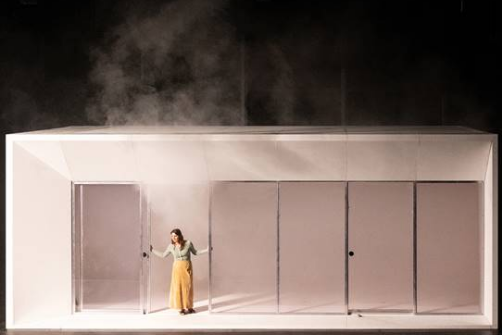 Photo by Lars Jan.
BOTTOM LINE: Early Morning Opera's theatricalization of Joan Didion's seminal essay The White Album effectively blurs the line between the past and the present. I have a love/hate relationship with personal essays, one likely caused by the whiplash of the college application experience—the memories are still fresh. Yet I’ve always recognized the art form as an instrumental tool in preserving a slice of history in its most intimate form. If we were to curate essays of significance that will continue to influence thinkers for years to come, Joan Didion’s The White Album would surely be high up on the list. Billed as “a journalistic mosaic,” the 1979 publication is exquisitely composed and heroically vulnerable. It’s the crystallization of the author’s disquietude in the late 1960s through 1970s, transformed into something volatile and galvanizing, even today. It is now 2018, exactly half a century since 1968; in this age when everything seems to reach a critical mass, Early Morning Opera’s Lars Jan revisits The White Album, and scales up something that’s often experienced in a more private setting. He developed the piece with Mia Barron, who steps into the shoes of Joan Didion herself (figuratively, since Barron remains barefoot, adding to the grounded presence with which she commands the space), to deliver the entirety of the essay. In addition to the traditional proscenium seating, a dozen or so audience members become extras on a film set, simultaneously experiencing the performance up close, as well as being watched as they turn into house guests in a 1960s party, music fans at a Doors concert, and so forth. The snapshots from the past, so to speak, are conjured up by the narration, staged within an architectural structure (by P-A-T-T-E-R-N-S Architecture) that looks both like a framed photograph and an exhibition room at a museum. The exhibitions, of course, are of people of Didion’s time in Los Angeles: illusory characters including Hollywood wave makers like Roman Polanski and Sharon Tate Polanski; those orbiting the Black Panther shootout of 1968—Huey Newton and Eldridge Cleaver; as well as the legendary Jim Morrison and the rest of the Doors. The well-dressed New Yorkers sitting behind glass doors raising cans of beer and LaCroix cause some mental dissonance: are we still talking about the 60s, or is the text very much about now? The featured audience members, who stand in for the shadows of the past, become Didion’s menagerie, which she observes from the outside in. The essay itself, as well as the live production, both befit the title—in some ways, the piece is a study of white America, and especially of educated white America—an isolated bunch, who tend to be shielded from the danger that is to be anything but white. And Didion sees it all clearly. About his trial (detailed in the essay), Huey Newton quotes James Baldwin: “To be black and conscious in America is to be in a constant state of rage.” To be fair, to be conscious in 2018 America is to be in a constant state of rage—perhaps to various degrees depending on the shade of your skin, but nevertheless rage. But still, it makes you wonder: have we done enough? Have we evolved enough? Have we evolved at all? As Didion, Barron becomes the medium between past and present, translating in her body Didion's own bouts of vertigo and nausea as a result of MS. There’s a gravitas and passion so palpable in the performer/creator that you know she understands every word she’s uttering, and that this is a text that she’s lived, breathed, digested, and internalized. Through that text, she becomes the priestess who lifts Didion’s prophetic words off the page to connect our contemporary discomfort with fever dreams from the past. Four other performers weave in and out of the audience so seamlessly that it actually took me a minute to determine which ones are part of the ensemble. Stephanie Regina, Andrew Schneider, Micaela Taylor, and Sharon Udoh become vessels of various characters in this production, reanimating with a heightened style scenes from the late 60s. These fascinating, grotesque, and all-too-familiar images are at once ancient memories and yesterday’s front-page stories: there is police brutality, the pettiness of healthcare system, and then, and then… Udoh’s performance of some of the Doors’ most iconic numbers, including "Light My Fire," is also guttural and haunting. There are also some ingenious staging moments. At one point, Barron disappears into a fog within the structure to then reappear atop it. Andrew Schneider and Chu-hsuan Chang’s lighting makes it look like she’s standing above a storm cloud. Yet this production is still trapped inside of intellectualization, which is something Didion herself has realized and pointed out in the essay. This is a danger for the progressively minded, for intellectuals who understand the need for action but lack the tools for actual change. The staged version of The White Album also ends on a relatively pessimistic note. An essayist often constrains herself with simply describing a social problem, because we need to drink that bitter medicine to realize the naked truth. But with a theatrical piece, I long for something beyond lamentation, so as not to be left more hopeless than when the production began. The White Album is by Lars Jan / Early Morning Opera, based on Joan Didion's essay. Directed by Lars Jan. Architectural Design by P-A-T-T-E-R-N-S Architecture. Lighting Design by Andrew Schneider & Chu-hsuan Chang. Music and Sound Design by Jonathan Snipes. Choreography by Stephanie Zaletel. Dramaturgy by David Bruin. Produced with Miranda Wright and Los Angeles Performance Practice. The cast is Mia Barron, with Stephanie Regina, Andrew Schneider, Micaela Taylor, and Sharon Udoh.